Suicide Bombers Target "Kufuor Buses"
There are glaring indications that Ghana may soon experience her first suicide bomb attack, if a faceless group that issued the threat continues to outwit the police. Leaders of the group are reportedly considering the suicide-bombing option, following the failure of their stone-throwing campaign to force the Kufuor-mass-transit buses off the roads. 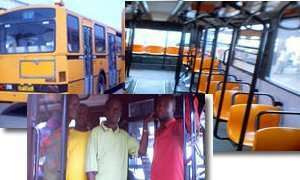 Painstaking investigations conducted by The Heritage have revealed that a group numbering about 27 is bent on destroying the mass transit buses to give an undue advantage to their benefactors and patrons who are members of a transport organization. So far, over seven buses have been destroyed by these unidentified 'rebels'. The activities of the group have become so alarming that some commuters have stopped using the buses, since they do not know when and where they would be attacked. Formed about two months ago with their metro buses as their main target, they operate along Mallam-Kasoa road, most particularly around Amanfrom, Tuba and GBC area. In the course of the investigations, The Heritage unearthed the phone number of the leader of the group who granted us an interview but would not give his name. He threatened that "if persuasion failed force must be applied." Asked to explain what that statement means, he simply said: "We shall be thinking of suicide bombing." On why they were attacking innocent passengers instead of the metro transit authorities, the supposed leader, who sounded very confident, said the introduction of the Metro Transport System had led to the 'collapse of our master's business' and that the only way they could have their 'chop money' was to destroy the buses. Meanwhile on Thursday, March 11, in the course of investigations, this reporter came under attack in one of the metro buses. This was after he had visited the KASOA branch of the GPRTU, which many accused of being behind the attacks. On reaching Amanfrom, the Mallam-Kasoa highway with one of the metro buses, a woman sitting beside this reporter advised him to close the glass window since anything could happen. True to her words at about 5pm, the stone-throwing started from all corners, whereupon the lady remarked: "I told you so; these days it's only the brave who patronize these Kufuor buses; some people just want to sabotage the good efforts of the governments; God help Ghana," the hapless lady prayed. Members of the group reportedly communicate through mobile phones to pinpoint the location of metro buses to one another, especially those lying in ambush, as to when the buses would reach their hideout.